In the early years of piano making the sound board was a thin straight board that was stiffened with wooden rails glued underneath. Borrowing from violin making piano makers then turned to a curved spherical construction . But contrary to the violin makers that carve the spherical crown out of solid timber, piano makers produced this by bending . This causes uncontrollable tensions similar to the effort to wrap a ball in paper. This is not possible without either tears or plights. 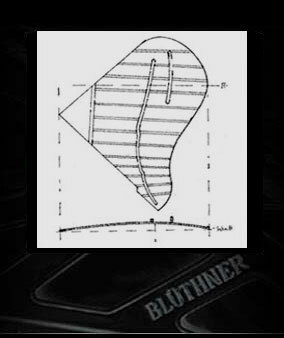 For this reason BlĂĽthner developed a cylindrical crown of the sound board where these tensions are avoided and the amount of crown can be precisely defined. The bars underneath are already preshaped and together with the inner tension that develops when the s. board picks up moisture the crown is formed.